I decided to return to London for this week’s parkrun. I had already completed the full set of London parkruns last year but the trouble with parkrun is that new ones keep popping up all the time. Thus it was that I headed off to Catford this morning. Catford is in the southeast corner of Greater London, just next to Lewisham. It is one of those communities you encounter as you drive round the A205, South Circular. 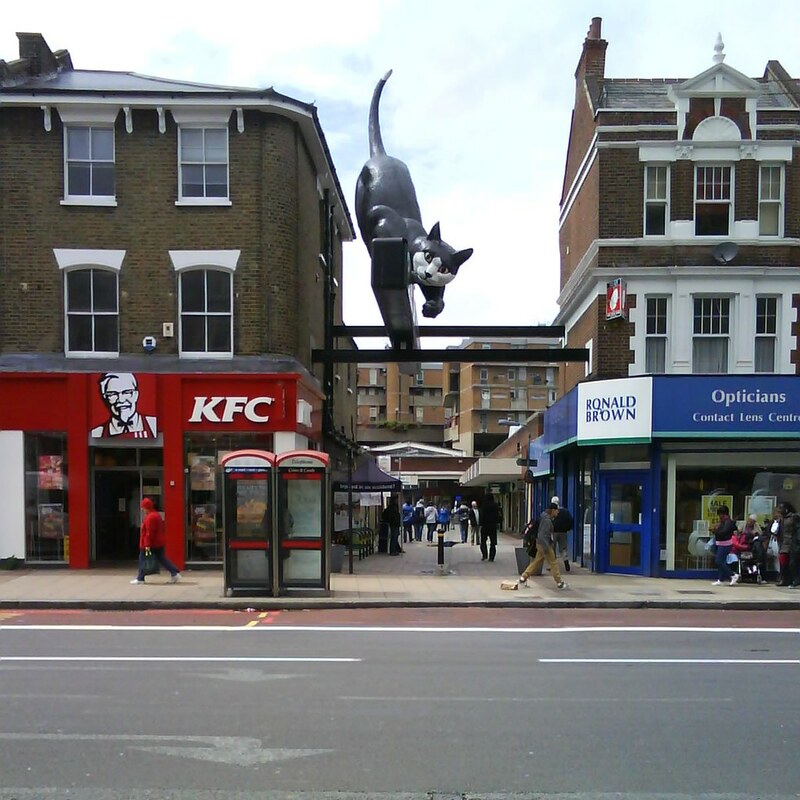 You always know when you have arrived in Catford because there is a giant fibreglass model of a cat perched on top of the local KFC! The origins of the name Catford are somewhat disputed. The ‘ford’ bit is easy enough - there was a ford here over the river Ravensbourne. As for the ‘cat’ bit - some think this was a ford where cattle crossed. Others suggest this was a ford where wild cats were to be seen. And others propose that there was an Anglo-Saxon chieftain called “Cat” or “Kat” who owned the land around the ford. You decide! The name was first recorded in 1254, around the time that the Abbey of Ghent, which had owned the land hereabouts since at least the early tenth century, sold it off as a sub-manor. Two moated houses are recorded as having been built thereafter, one near Catford Bridge and the other at Rushey Green. Each of these houses had become the nucleus of a small hamlet by the mid-18th century. For much of its history, Catford was a quiet rural area up in the northwest corner of Kent. The opening of Catford Bridge station on the Mid Kent Railway in 1857 encouraged the construction of houses for the more affluent middle classes. In 1875 the Lewisham board of works built offices here, which later became the town hall, and in the 1880s parades of shops lined Catford Broadway and the parish church of St Laurence was consecrated. With the opening of Catford station in 1892 and the arrival of tram services, suburban development began in earnest. Landowners sold their farms and major developers built extensive estates for clerical commuters, with some light industry to the south. Between the wars, numerous places of entertainment were built, including a theatre, concert hall and greyhound stadium, together with new shops on the Broadway. This area became one of the most densely populated of outer London. Plenty of well known people came from here though not all of them regarded the place with affection. Comedian Spike Milligan wrote a poem “Catford 1933“ which depicts the grimness of working class life in the 1930s. The place still has a rough reputation. Many of the gangs responsible for the current plague of knife crime come from round here or neighbouring Lewisham. On a more optimistic note, Catford is one of the London areas singled out for regeneration. Some of the more brutalist buildings are to be demolished, smarter homes built and better paving, street lighting to be provided. 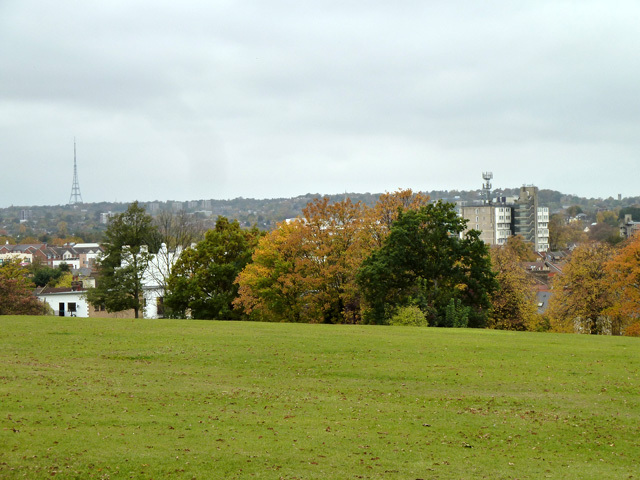 Catford parkrun takes place in Mountsfield Park, just to the east of the town centre. Mountsfield Park began as the grounds of a fine Victorian house built for Henry Tibbets Stainton, a noted entomologist, in 1845. In 1903 the estate was bequeathed to the local council by his widow. The house was subsequently demolished and the grounds opened up to to the public. It is an attractive patch of greenery in an area of higher ground amidst the housing estates. There are nice views out to Crystal Palace to the south and Dulwich to the west. The parkrun course consists of three laps around the perimeter, the third lap slightly shorter than the first two. It is slightly undulating and a mixture of grass and tarmac and dirt/gravel track, following the path round the outside but sometimes veering off to do a loop around the sports pitches. It’s not the fastest course around but it’s not excessively testing. It was a nice bright fresh morning in South London and so we had quite a good turnout for the seventeenth running of this event. At the start I was standing next to a young man in a blue vest who was gulping down some Lucozade as we started. He shot off, still clutching the bottle, and disappeared into the distance. I ran with a small pack in joint second place. By the time we came to the end of lap one I had worked through to about fifth in a time of about 6:40. I slowed, but only very slightly, on lap two and then kept going on lap three to eventually finish fifth. My time was 19:43, which was pleasing as it wasn’t the fastest course. I can’t say I was over excited this morning about a trip to Catford but, as it turned out, I enjoyed the experience very much. I can recommend this parkrun to anyone who lives in this corner of southeast London. My statistics for today - that was parkrun venue number 176. I managed the full set today - first in my age group, first on age graded scores and setting a new age category course best. If you’d like a little glimpse of Mountsfield Park and the parkrun and have a few minutes to spare, here’s a YouTube video of a previous event.